I am hoping to bring the Hall of Fame feature back to Phungo for a while now. With the latest edition of A&G trending throughout the card blogs, I thought that I would take a look at a mini from the 1975 Topps Series. Recently Bad Wax mentioned the set as a possible goal that is fun and affordable. Mike Schmidt is a perfect subject to restart Hall of Fame Profile with - He is probably the Phillies most iconic Hall of Fame Player - Of the four Phillies Hall of Fame Players that have played since 1950 he is the only one that played his entire career with the Phils. 22+ years after his retirement, Schmidt's 548 Home Runs still rank 15th on the career leaders list - five or six of the guys that have passed him in those 22 years would probably need to have an asterisk* next to their names in some record books. 1975 is Topps third offering of a Mike Schmidt base card. It is the 2nd time that Schmidt is the sole player on a card - His 1973 RC is a shared card that also features Ron Cey and John Hilton. The Recent Lo-Ebay auction for the 1975 Topps #70 card was $2.25 for the Base version and $3.48 for the mini. The mini pictured above was picked up at a card show last year for roughly $3.50, I think the Base card is a legacy from my younger days - The corners are a little dinged but overall the card remains in good shape. While everyone else is going nuts over 2011 AnG, we are checking out a different retro product from way back in 2009. The 2 releases of Obak are somewhat similar to Allen & GInter in that they are both based off of Tobacco Card products and they both contain cards of a historic nature. Both also have a bunch of minis. 19 Minis in addtion to the Crosby SP parallel. I was very happy with the Obak Box. I love the historical nature of the cards. There are 100 different subjects that have many different backgrounds - most of them somewhat baseball related. Overall the cards look nice, but the card stock isn't as good as I would like. My other complaint is that the Serial Numbered cards are basically similar to the base cards and that the serial numbers are done via print rather than stamped - using these to inflate the number of "Hits" in the box is a bit of a misnomer. The lower 30 cards in the set are part of either the "Pro Debut" or the "History in the Making" series with rookies and prospects - The Healthy checklist includes Pedro Alvarez, Eric Hosmer, Brian Matusz, Lars Anderson, Gordon Beckham, Neftali Feliz, Tommy Hanson, Heyward, Austin Jackson, Andrew McCutcheon, Jesus Montero, Moustakas, Buster Posey, Carlos Santana, Mike Stanton, and Brett Wallace. Overall, For $34/Box with a bunch of interesting subjects (and 2 autos) it is hard to beat the enjoyment/$$ of 09 Obak. I am thinking of looking at a box of 2010 Obak in the future. The Baseball Hall of Fame welcomes Pat Gillick today. 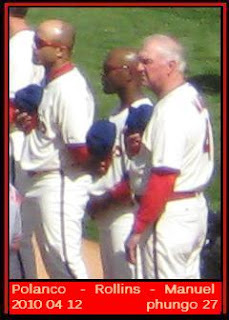 Gillick was the reigning GM when the Phillies won tghe 2008 World Series. His key acquisitions for that club included Jamie Moyer, Jayson Werth, and Joe Blanton. Gillick was also involved with The Toronto Blue Jays teams that won World Championships in 1992 and 93 as well as successful teams in Baltimore and Seattle. In addition to Gillick Philadelphia area Baseball columnist Bill Conlin will also be inducted into the Hall today. As you likely know the big time inductees today are Bert Blyleven and Robert Alomar. Did a quick local Baseball Tour this past weekend. Orioles Loss v Indians on Friday Night. Baseball Card Show in York PA on Saturday. Bryce Harper Show on Saturday Night. There was a definite buzz during the Senators game, and it was exciting to see a fairly full house at an AA game hang on every pitch of his ABs. In the end Harper who is yet to homer at the AA level had a pedestrian 1-4 night. He did hit a ball to the track at the deepest part of the park just right of center. 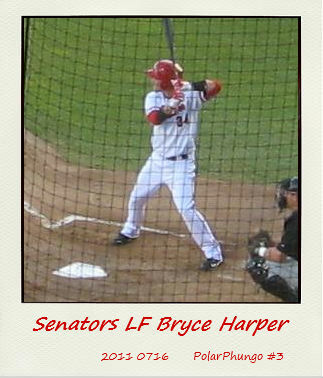 His one hit led to him scoring a run - Harper looked good running the bases advancing on a fielders choice, Wild pitch and a Flyout. The Senators ended up losing an otherwise disaster of a game 11-5 to the Akron Aeros (Cleveland Indians AA) - But like a lot of minor league parks, there was a lot of other entertainment. The park was nice although since it is on an Island on the Susquahanna River there are a lot of bugs - Mayflies. 1B Tyler Moore had a couple of Hits including a homer for the good guys. Beau Mills had a homer for the Aeros - I think Mills might have been player of the week for the Eastern League. Another obsolete 2011 Phungo Card. Other folks are showing off A&G, unfortunately Team Phungo is trying to be fiscally prudent at the present time and A&G will have to wait - well at least till the wkend. And I also haven't fixed my scanner situation, so expect a steady diet of Phungo Cards and Photos until that situation gets rectified. K-Rod is on the move to Milwaukee - not sure how much this helps the Brew Crew. 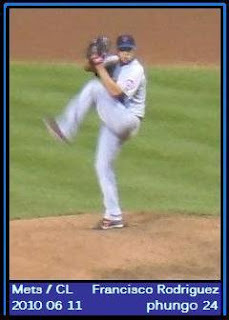 Axelrod seems like a competent closer, but I don't know what they have in front of him. This photo was taken in Baltimore during interleague play last season - you can read more about that trip here. Coincidentally I am headed back to Camden Yards this weeknd - The O's are hosting a pretty exciting Indians squad and it is looking like a real nice night for baseball. I try to honor everyone who sends me cards and I try and keep semi up to date on my trades. Unfortunately, I have lost track of these things recently. Swag from various Trades, Donations and Breaks. I am not sure exactly where these cards came from. I am pretty sure some came from Night Owl, and some from 30 Year Old Cardboard - There are also likely cards from a Thorzul Group Break. I also got a nice stack of Vintage cards not featured here from Dan over at The Other World. Part of the reason that I haven't been as organized with card trade posts or posts at all is that Team Phungo has been on the Move. Not the Blog - we are still here. But the Headquarters have moved. We didn't move far, but I am happy to announce that Team Phungo is out of apartment living and has moved on to Full on House duty. Stepping up to the house level has been fun, but it is also a lot of work. I am hoping that things will settle down at least a little bit at some point and I will get back to some card related activities. If you sent me an email regarding trading or I haven't gotten back a reciprocal trade bear with me, I will try and get to everything - I know I owe Dan cards, but I can't remember what we were trading. ok back to unpacking for Team Phungo. The rest of you can go back to enjoying the All-Star Game. I have been toying around with ways to post my Most Wanted Cards, I wanted to something different then just saying these are my 5 most wanted cards. The idea that eventually came to me was to break down my most wanted cards as an All-Star squad. With the Mid-Summer classic upon us it is a good time for Team Phungo to debut the inaugural edition of the Most Wanted All-Stars. C - 2008 Bowman Draft/Prospects #94 Lou Marson. For the 2 Futures games I have been to I am trying to collect all the Futures Game cards. Marson represented the Phillies at the 2008 game. One of my ongoing projects is building a collection of cards of all the Hall of Famers. The hard part is I want cards from the players active careers. I have plenty of Doerr retro/heritage cards, but still need one from his playing days. This is the Mike Schmidt (and Ron Cey) rookie card. Likely the biggest omission in my collection. Trying to collect autograph cards from all of the players that were on the 2008 Phils World Championship team. I think I have all of the position starters other than Rollins and Victorino. There are two Topps Cards from Charlie Manuel's playing days - I am looking for either this one or his 1970 card. I'd prefer the '71 , unfortunately is a hard to find short print. I have the complete 1979 set - a few of the cards I got signed and now I would like to replace those for my '79 set so I can keep the autographed cards together. I wanted to get Autos of the Four living Phillies Hall of Famers, Roberts was the missing one. Well now I have autos of all of the Phillies living Hall of Famers, just that Roberts is no longer with us. Relatively recent great card, that is unfortunately not in my collection. Eagles NFL HoF member. Really should get his Auto into my collection. This one isn't even out yet, but it is already on my want list!! There you have it, I think that its a good mix of cards - There are hard to find and pricey vintage cards and some relatively ordinary recent commons plus a lot of other stuff in the middle. I have been busy lately, but I want to get back in the Trading Game - hopefully this list will kick start me back into action. Hopefully we will hear sometime this weekend that Andrew McCutchen has made the NL All-Star roster. McCutchen's average is hovering just below .300 with an OBP of .393 (9th NL) and 13 homers - those are all numbers that don't account for his speed (15 steals) and the Pirates enter play on Saturday a game out of first place! When was the last time that happened on the weekend prior to the All-Star Break. Photo taken April third of 2010 during the Phils Pirates On Deck series. I have been following McCutchen's career for a while now and am happy to see the Bucos return to respectability. They are an exciting young team and I hope they can stick around in the NL central this season. The All-Star Rosters are out. The sole Phillies player to be voted onto the team is Third Baseman Placido Polanco. This years marks Placido's 2nd All-Star appearance, both at different positions. 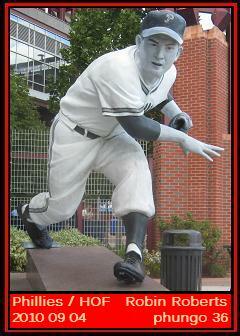 His previous All-Star start was as a second baseman representing the Tigers for his then manager Jim Leyland in 2007. Polanco was new to the Phils in 2010 and for the 2011 Phungo Set I wanted to produce a card of the fan favorite. I didn't have many very good shots of Placido and went with this Photo from the 2010 opener. Charlie Manuel is also on the card which is noteworthy going into the All-Star Break as he is the manager that finally led the NL to a victory in the Mid-Summer Classic for the first time in over a decade. The 2010 NL victory was the first one since the NL won the game in Philadelphia (at the Vet) in 1996.